Kenny Acheson started his career driving his father's race cars, and after success in Northern Ireland he moved to England in 1978 where he won 29 races and all three Formula Ford championships. He switched to Formula 3, narrowly missing out on that title in 1980. In 1981 he drove in Formula 2, but his season ended prematurely when he was involved in a crash which left him with broken legs. 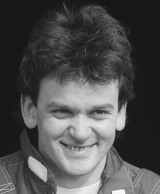 In 1983 he made his F1 debut, driving a RAM March, but failed to qualify in his first seven attempts; on the eighth, in South Africa, he made the starting grid and finished 12th. The following season he returned to the RAM team following the death of Manfred Winkelhock, qualifying for two more GPs, failing to finish either. After a brief spell with CART, he continued his career in Japan, winning the Japanese Sportscar Championship in 1987, returning to Europe in 1988 to drive for Sauber-Mercedes in the Sportscar World Championship. With Mauro Baldi he finished second at Le Mans before winning at Brands Hatch and Spa. Surprisingly not re-signed by Sauber, he moved to Nissan with little success, before spending seasons with Jaguar and Toyota. He then returned to Japan, this time in GT racing, but in 1996 he was involved in a serious crash at the Daytona 24 Hours, after which he opted to end his racing career.